It costs nothing to get started as a virtual assistant. #vatip Gotta Tweet! Forward your domain to your Facebook business page if you’re not ready to set up your website. #vatip Gotta Tweet! Rather than set up a table at an event, walk around and meet people. #vatip Gotta Tweet! Hello! Hello! Welcome to episode number six. I am so glad that you’re here and glad that you’re listening to this podcast episode. Today we’re going to talk about what does it cost. 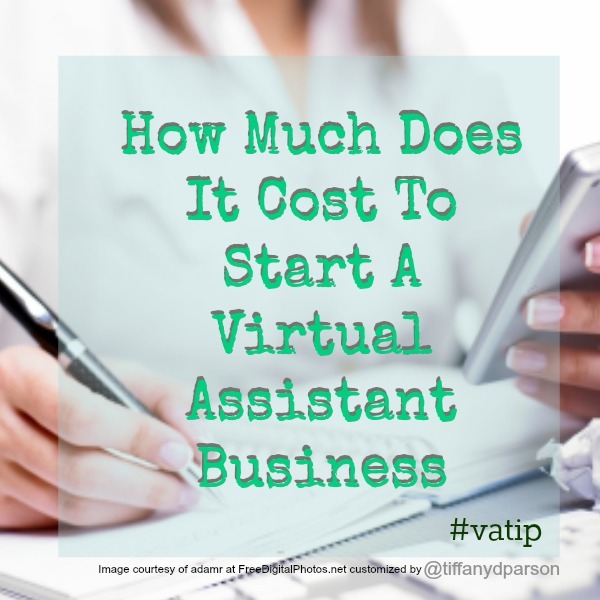 How much does it cost to get started as a virtual assistant? Now, I realize some of you are already in business as of yet, but there are others of you that have been collecting lots of information, been doing research, and reading and reading and reading. Now it’s time to take action! I’m going to tell you how much it costs to get started in your VA business. A little pick up from last week and that is with your Elance profile. Elance has two options for you. They’ve got a free membership and a premium membership that’s $10 a month. Dig around on Elance. Find out what the price differences are and decide for yourself. Either way, sign up for the free. Go ahead and start bidding. You can upgrade during the month as you go a long. Don’t let that stop you because you’re stuck at, oh, should I decide free or premium. Sign up for the free. Add the premium later when you have a chance to see what the differences are, and you’ve gotten a chance to experience it for yourself. That’s number one. You should already have a computer. Most of us have computers. You should already have that, so that’s not an added cost. Number three – phone. You want to get your Skype account, free account, Skype ID. Because right now you’re starting out on Elance, putting bids in for different projects, testing the waters, seeing if you really want to do this thing of being a virtual assistant. Oh, and in regards to email, if you’re just doing Elance, your Gmail account is fine. Most of the communication with your client will take place in the private messaging board between you and them. They may ask for your email for certain things depending on what you’re doing. Like if you’re working on their blog or you’re helping with their Hootsuite, they may need your email, and it’s okay at this point to use Gmail. All right. That’s the beginning, and the most I’ve said there is $10 to get started as a virtual assistant, and you don’t even have to do the $10 if you don’t want to, to get started on Skype. You could go ahead and start with that free account. Now, you’ve already started. You’re on Elance. You’re enjoying it. What is the next phase? Well, the next phase – now it’s time to get outside of your computer and do your networking. How much does that cost? Well, it depends on the events that are going on in your area. I’ve been opening myself up to do local networking, and so one of the events I attended there wasn’t a fee to attend, but it was at a local restaurant so you bought your lunch. So the price of lunch for this event, and then if you wanted to be a full-fledged member of the group, there was an annual fee for that. It will vary based on what the networking event is. It’s just going to depend. If you’re looking on Meetup.com for different opportunities, you may find things that cost $20, $25. There may be, you know, a fee for that particular event, but it will vary depending on what the networking event is. There’s one I saw, again, this is my area, was like $20 to get in and be a part of everything that’s going on. If you wanted to actually have a table, it was like $50. I’ve seen some for $75. I will tell you, I set up a table one time for Virtual Hired Hand, and it was a total bust. I wouldn’t recommend setting up a table for your virtual assistant business. It’s just not one of those things that makes sense at a table. You’re better off just being a part of the crowd, walking around, meeting the people that are actually attending, finding out who they are and what they need. Walk around. See the people at the different tables. Find out who they are, what they could possibly need from a virtual assistant. This brings up something really interesting, and I actually had it in my notes and went blank in my mind once I started talking and the microphone turned on. That is how do you decide what networking event to go to? This is still fitting in with the cost, because again, it varies based on the event. But how do you even decide if this is an event for you? You have to know who your clients are. Who do you want your clients to be? Is this an event where a potential client will be? If the answer is a no, then you shouldn’t be there. If your clients aren’t there, why are you there wasting time? If there’s a fee, wasting money. You want to be in places networking where your clients are. The other question to ask yourself: will connectors be there? Connectors are those people who may not be able to use what you offer, but they know someone who can use what you offer, or they know someone who knows someone that can use what you offer. Is your customer going to be there? Your ideal client, the person you want to work with, will they be there, and will connectors be at this networking event? Really investigate it to find out. Get a feel for who’s going to be there. Where’s the location? What time it is. That will give you a feel for what the environment will be like and if this is the place you want to be at. You want your business to be associated with, because anyone you meet, they will forever remember that they met you at x event. You don’t have to go to every single one that comes up or comes across your email or you see on Facebook. You don’t have to go to every single one. Really think about whether this is a good match for your business, and of course if it’s not, then you move on and find something else that is. Now, let’s say this event is perfect for your business. There’ll be all kinds of people there that fit right in with the type of people that you serve, and there’ll also be connectors there. If these people can’t use you right now, they may know somebody, so it’s a perfect event. Now, in addition to that event cost, we have another cost, which is business cards and there are different websites. Vistaprint.com. Moo.com is one of my favorites. It’s moo.com and they have really creative business cards, you know, as far as the shapes and things. You upload what design you want, put your picture on it, logo, whatever information you want on your business card, and it’s really sleek, really modern cards. Check them out. On my business card I like to include, of course, my name, my title, my company name, and my website. But I also include the methods I want to be contacted. I don’t even have a phone number on my business card because the method that I want for my initial contact is through social media or email, one of the two. That way I can get a feel of whether this person is someone that is the right fit for my business, or if they are just a tire kicker or something like that, versus a phone call. I’ve got SpeakPipe set up on my website, and that allows people to leave you a voicemail on your website and you can even respond back through audio and they’ll get a recording of it in their email. That’s really good for people who want to talk. They need to feel like they’re speaking to a voice, and so this helps with doing that. That just gives a buffer between me and the person who is seeking out my business for whatever reason. Okay, because I’m not sitting on Skype all day. I use a Skype number. I’m not sitting on Skype all day. The only time I log in to Skype is when I have a scheduled appointment. If I don’t have a scheduled appointment on Skype, I’m not on Skype, so there’s no point in me giving out the phone number and it goes to voicemail. SpeakPipe works fantastically. I got a message yesterday, got notified through my email. I was able to go to the SpeakPipe app on my iPhone and listen to the recording and then, you know, go from there, and I actually responded today because it was after hours and I don’t respond back during after hours. Anyway, that’s the business cards. Then the next cost is your Skype number. Earlier we talked about if you’re getting started with Elance, you want to have a Skype ID. Now, if you’re doing networking and you need a phone number, you want to have a Skype phone number. They have different specials with their phone number. If I’m not mistaken, I think it’s like $30 for the year. If you sign up for the 12 months, you get the 50% off, something like that. Don’t quote me on that. Double check skype.com to find out for sure, but it’s something ridiculous like $30 for the whole year. Really, really cheap to have your own phone number with your area code, and you set up your voicemail through Skype and no one knows the difference on the other end. I’m not a fan of Google Voice because if you’ve ever called Google Voice, you know that person has Google Voice. It’ll say something like please hold while we locate the person you’re trying to call, and then music will come on. It may even say Google Voice. I don’t know, but I know everybody that has Google Voice, it does that. I hate it. I hate that. Skype is just regular voicemail just like if somebody were calling your cell phone. Then the next thing is you’re going to have your email address on the business card if you want to be contacted through email. You want a professional email. Now wouldn’t be the time to put Gmail on your business card. You want it to be whatever your business domain is. If you don’t have a website, and you don’t have to have a website to get started, but you already know what you want your business name to be, I recommend you register it with GoDaddy, Namecheap, somebody like that. Register your domain name and forward it to your Facebook page if you’re not ready to get your website set up. To register your domain name, I’ve seen it anywhere from like $1 and some change all the way to $12 or $14, just depending on if there are any specials or promotion codes or something like that, that are available. I’m going to be sure and include all the links that I’m talking about in today’s show. It’ll be in the show notes, all the links. But if you’re not ready to have a full-blown website, you don’t have to if your focus is on Elance and then networking locally, you don’t have to have a full-blown website, but you want that domain name for the sole purpose of the email so you can be like my email is tiffany@virtualhiredhand.com, and you want that instead of tiffany@gmail.com because that’s more professional if someone’s looking at your business card. If that website is not set up, don’t put the web address on your business card. Somebody may still look at your email address and be like, oh, okay, she’s got virtualhiredhand.com for her email. I’m going to go check it out. But remember, you’re going to forward it to Facebook if you’re not ready. Okay. Now, I’m saying forward it to Facebook, not your personal profile, but to a Facebook business page. Okay. I’m thinking in my mind, I should probably have a video for you guys for that so you’ll know how to do that. Let me know in the comments if I should do that. If that’s worthwhile for you, if that will be helpful. If not, you don’t need it, no problem. If I don’t hear from anybody, I won’t create it. But if it comes back to my mind, I might create it anyway. Somebody out there may need it. But anyway, forward it to your Facebook page, and have your Facebook be active, meaning you’re posting on it. So that if someone does go to it, they see that you are active, that you are sharing. I had this wild idea this week when I was looking at the possibilities of how much it would cost to get started and forwarding your domain name to your Facebook page, and I had like this crazy thought and I know there’s not a lot of views on Facebook. People are complaining, dah, dah, dah, Facebook, whatever, but that doesn’t matter for the purpose of your forwarding. You can still share your knowledge and information on your Facebook page. This is a thought. You’ve got some information in your head right now about your business, even if you’re just getting started, that clients are going to want to know, and it’s based on the questions they’ve been asking you. What have they asked you so far? More than likely it’s kind of similar to today’s show and that’s how much would it cost to blank? You could write an article and since you’re forwarding your domain to Facebook, put it on your Facebook page. You could put it on there as a note or as a post, because keep in mind, you’re using it for the purpose of your domain name, as a temporary forwarder for that, and if you put that content there and you have a prospective client and they just happen to go to your website even though you didn’t put your website on your card, and they see this content and they see you and who you are and get to know your personality, that helps them right away know if this is somebody I want to talk to further in regards to my business. It doesn’t have to be complicated on our Facebook page. Sometimes I make it too complicated. I promise you every time I don’t overthink something, I’m blown away by what happens as a result of just posting something. Not just random stuff, but things that I think in my head and I’m like, oh, I need to say that, but if I overthink it and I don’t. Or I overthink a quote. I used to share a lot of quotes, but then it got to the point where I’m wondering, okay, who is this person I’m quoting? Do they have the same morals, values, and beliefs as I do? Then it got to the point where it’s like, okay, I’m going to have to look up every single person I’m quoting to find out who they are to make sure they’re in line, and that is so important. There’s all kind of mess and craziness online. It’s just amazing to me all this foolishness that’s out there that you could be connecting yourself to because you’re quoting somebody and you’ve got to be careful who that is. Anyway, I think I totally went off on a tangent. But think about posting some stuff on your page even though you may not have your website up. Then once you get your website up, just imagine this: if you put that content, you’ve already written it, it’s on Facebook, you’ve gotten some engagements, it doesn’t have to be a lot, it doesn’t matter really, you know, using it as storage place for your future content, for you to flesh out ideas and stuff. Wouldn’t that be cool? Then you’re all set when you are ready to start blogging on your own page, to start sending out newsletters and get stuff set up on your own website. Test it out. Let me know how that works. Enjoy your social media. Enjoy the social aspect of it. Share the information. Share things you think would be helpful to your potential clients. Do that kind of stuff on your page in addition to other information based on the questions that they ask you. That’s my phone. I just dropped my phone. I am so sorry, on the recording last week I could hear my paper turning and I thought, oh, that is so not good that I could hear my paper turning. But this show is unedited. I didn’t want to go back and fix it. I just, you know, want it to be like we’re having a conversation at Starbucks, and if my paper was flipping and going on at Starbucks, I may not notice it because we’re in such conversation. But anyway, those are the things that you would have to pay for to get started in your virtual assistant business. It’s not much at all if you’re just at the very beginning stages in Elance, and you know my thought is to give you a chance to test the waters, see what things you like to do, and then branch out further. So when you get to the networking event, you already know what types of things you enjoy providing to clients, and you can explain it to somebody who has no idea. There’s still people out there who have no idea what a virtual assistant does, no idea what they’re capable of, and it’s up to us to tell them who we are and what we do. Anyway, that is all. I want you to reference the show notes to get the full list of what the things are that you would pay for initially. Go forth. Have a wonderful and fabulous week. We’ll chat next time.